Over the weekend, a Tesla Model X caught fire on the frozen surface of Lake Champlain in Vermont. The fire happened around 8 p.m. on Sunday, and the fire almost completely consumed the vehicle. The Shelburne Police Department tells Popular Mechanics that the owner of the vehicle took their Tesla onto the ice to go fishing, and that at some point during the expedition the car hit a rock. The car started making unusual noises, and shortly after that caught fire. Had to get daughter, dog, and myself out of the house because realtors had showings scheduled starting at ten. What do you do for a couple of hours while that's going on? I drove around for a while, then decided on Gabriel Park, which is a really huge park in SW Portland, around half a mile long, although width varies. I went to the back end, which is mostly woods, because neither daughter nor dog had ever been to that part. Naturally, it was raining, but that's normal here in the Pacific Northwest. Got back home after the showing thing, dropped off dog and daughter, had a short cup of coffee, then off to the next thing. Anyway, after prowling the neighborhood, I returned to the clinic and resumed onsite waiting. Eventually, he hobbled out, and the Max Taxi took him home. California Gov. Gavin Newsom announced in his State of the State address Tuesday that California would abandon the plan to build high-speed rail between San Francisco and Los Angeles. It's about time that turkey was basted. Airplane seat assignments have gone the way of free checked luggage and in-flight meals, as major airlines shift from selling all-inclusive tickets to an a-la-carte business model, offering seat selection at an added cost to consumers. Small wonder that more folks are opting to drive, or to go by train. Except, of course, those who enjoy being felt up by TSA agents. By the way, Oregon residents won't be able to board a plane next year if all they have is a driver's license photo ID, as the state keeps asking the feds for extensions to meet requirements of the REAL ID Act, and the feds seem to have decided that they've granted them long enough. Oregon's Democratics believe that they can pick and choose which - if any - federal laws they'll follow. That's why I renewed my passport a year or so ago, complete with the handy wallet card. Don't know about other Oregonians, but I can fly from Portland to Boise (or Canada, or Mexico) any time I want. "This is disruptive technology," said Dr. Christopher Ziebell, emergency room medical director at Austin's Dell Seton Medical Center. "But this time the disruption is disrupting forearms, elbows and heads." Among other things, like ankles and legs. And trauma surgeons are reporting daily occurrences in hospitals from San Diego to Denver to Austin. Some of these injuries have been life-threatening; others have left people permanently disabled. A large part of the problem is that these e-scooter renters don't use helmets or other protective gear; the whole idea behind the things is spur-of-the-moment: "Hey, scooter! Cool!" So their concept is to dump these things onto city streets with no regard for human safety. An added bonus: their "user agreements" embedded into the apps place all responsibility for any issues entirely on the rider. Got an $8000 hospital bill for surgeries, plates, and pins after the brakes failed when rolling downhill? Sorry about your luck. After Brogan's crash, her husband rushed her to the local urgent care. While waiting to be seen by doctors, she got several in-app messages from Lime saying she hadn't ended her ride and was still accruing charges. "Scooter unsafe no brakes now in emergency room multiple fractures," Brogan wrote back. Once out of the hospital, she emailed Lime to fully recount what happened. They had a brief back-and-forth in which Lime told her to file a claim for review. Brogan wrote back saying her out-of-pocket expenses totaled about $8,000 and asked if Lime would repay those losses. She said she never heard from the company again. Lime declined to comment. Some municipalities are now finally moving to eliminate riders from the equation entirely - they just ban the scooters completely. Many others, however, such as Painfully Regressive Portland, take the opposite approach: "Anything goes, folks; no rules, no protective gear, no problem!" But hey, let's have a conversation about "common-sense gun control". The California "Bullet Train" has become such a colossal waste of time, money, and other resources that an increasing number of residents are calling for the plug to be pulled on the whole thing. The land acquisition cases alone are moving so slowly that the judge hearing the cases is now referring to it as a lifetime job. Kings County is the epicenter of the disputes, where the drama plays out in Ross’ courtroom for just two days each month. The underlying stories are lengthy and convoluted. Even worse when one considers that the trains will carry no cargo (if they're ever built). And each passenger fare is anticipated to run around $1000, leading to the question of who would want to drop that kind of cash when they can fly from LA to SF nonstop for far less? The TSA considers some food items as liquids that you may not think of as such. For example, cranberry sauce. In a carry-on bag, cranberry sauce is limited to a container of no more 3.4 ounces that must be placed in a one-quart plastic bag along with your mouthwash and toothpaste. Lovely. I guess if you want to bring enough for dinner, you need to pack it in checked luggage. Thanks, Dubya. Crossing Delta off the list. An Air India pilot flew a Boeing 737 through a brick wall Friday. Incredibly, that marked the beginning of its journey and not the end. 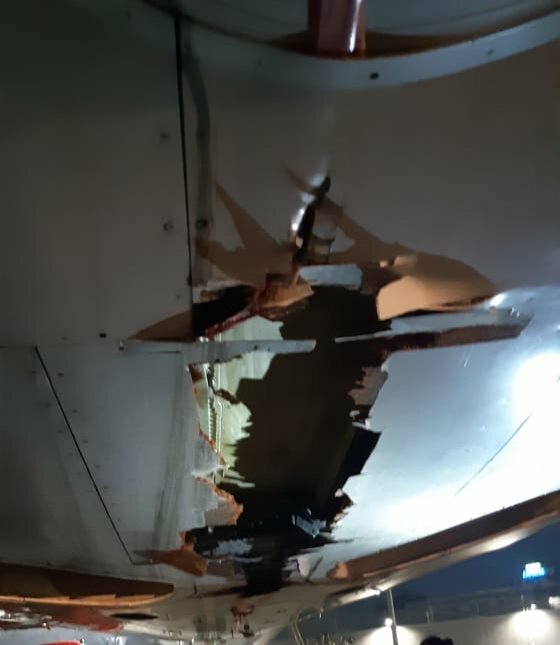 The jet not only clobbered the top of a five-foot perimeter wall but also destroyed a small landing guide tower as it climbed out of Tiruchirappalli International Airport in Tamil Nadu, India, shortly after midnight, the Times of India reported. Air India Express flight 611 continued to climb above the cloud line. It crossed the subcontinent and headed out over the Indian Ocean, the pilot apparently unaware that the plane had a gash along its belly and mesh fencing wrapped around the landing gear. Yeah, that's going to take some time to fix. If built, the new light rail route will run down the middle of Barbur Boulevard for miles. Oh, they'll build it, all right; they always do. Even when one of their proposals is voted down, they come up with a way to cram another multi-billion-dollar set of rail lines down our throats. This one, they claim, will "only" cost $3 billion (until, of course, it costs a lot more). Climate change from an unbiased perspective.